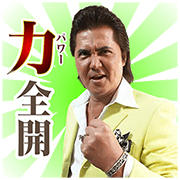 http://www.line-stickers.com/ – Riki Takeuchi 7 Line Sticker | Actor Riki Takeuchi bursts onto the screen in full, animated pop-up glory! This sticker set features Riki’s own recorded lines that will send ripples of energy through any LINE chat! When tapped, these stickers will play on iPhones even in silent mode.